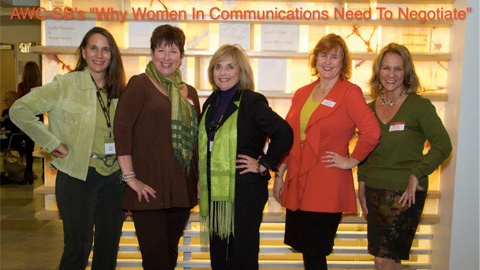 Women by nature are considered great communicators. But somewhat surprisingly, we lack an inherent desire to negotiate. We lean toward resolving conflict in ways that enable everyone to come out on top, rather than empowering ourselves to ask for what we need. At AWC-SB’s February event at Antioch University, Certified Personal and Executive Coach Dr. Lynn K. Jones moderated a discussion focused around the topic of why negotiation is so important for women. The field of expert panelists offered personal experiences and shared vital tips. Renee Grubb is the Co-Owner & Founder of Village Properties. Her success in real estate has hinged on her ability to strategize. During one notable short sale transaction, Renee had to negotiate with her firm not to cut commissions by systematically proving the significance of her and her team’s work. Renee asserts her own goals and those of her clients in every deal and backs that with full force. Panelist Lois Phillips, PhD, a Consultant, Author, Coach, Speechwriter and Conference Speaker, stated women, such as her, were not raised to push on others or challenge them face-to-face. She is convinced the first step to successful negotiation is to overcome this type of thinking. Britt Andreatta, PhD, Director of Learning & Development at Lynda.com, added that we all deal with our own internal negotiations every day. Aspects of our lives where we feel we lack can usually be traced back to a loss of confidence in ourselves. Lisa Gates, Co-Founder of She Negotiates, suggested women often don’t have the right frame of reference. We don’t know who we are so negotiating our own self-worth becomes impossible. On the topic of negotiating our salaries, Lisa Gates stated we must first identify opportunities to negotiate rather than assuming we should accept the first offer. We trust too much in the “just world phenomenon” and wrongly assume we will be rewarded for our hard work. Instead, Lisa offered, we should be confident enough to ask for proper compensation. Britt Andreatta, added that we should never lowball ourselves or be frightened about being turned down for asking for too much, because we will never be told we have asked for too little. Lois Phillips, explained that women often fail to think about the trajectory of their positions and to ask what future development opportunities are being considered. This, Lois mentions, is why we must empower ourselves from the start to know what salary is appropriate and what opportunities are likely, given the career track. Building on that note, Renee Grubb advised that women should walk into salary negotiations with knowledge of their own value. This entry was posted in Past Events and tagged Dr. Lynn K. Jones, Lois Phillips on March 21, 2013 by Lisa.